FAYETTEVILLE, Ark. – Brooke Matthews earned co-medalist honors and won three matches last week earning Southeastern Conference Golfer of the Week honors Tuesday. Matthews and the No. 6 Razorbacks are in Birmingham, Alabama, for the 2019 SEC Championship Wednesday-Sunday at the Legends Course at Greystone Country Club. Broadcast: The championship match on Sunday, April 21 will be televised live on SEC Network at 8:30 a.m. ET / 7:30 a.m. CT. The Razorbacks enter the week as the defending SEC Champions winning the program’s first conference title last year when the format changed to include match play. 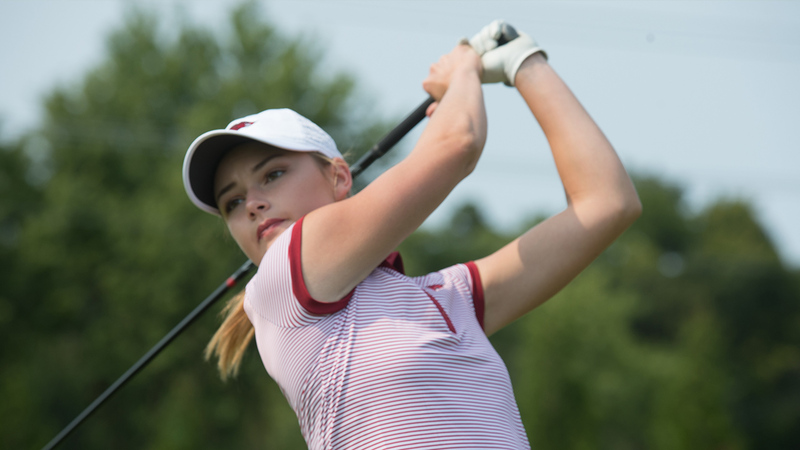 Maria Fassi was the co-medalist last year and she, along with seniors Dylan Kim and Kaylee Benton, return to lead Arkansas in their defense of the title this week. Matthews and freshman Ximena Gonzalez round out the lineup for Arkansas. Matthews earned co-medalist honors shooting a collegiate career-best 4-under 68 in the single round of stroke play at the Liz Murphey Collegiate Classic last week. It is her first medalist honor as a Razorback. The Rogers, Arkansas, native, turned 1-under and finished strong with three consecutive birdies on her final holes. Matthews went on to win all three of her matches defeating players from Louisville, Augusta and the host Georgia. She was the only Razorback to win all three matches at the Liz.